Skype is an application that has made our lives more enjoyable because it allows us to stay connected with our family and friends, especially for people like me who live thousands of Km away from their loved ones. We can use Skype from our mobile phones or computers, we just need an Internet connection or add some money to make international calls. 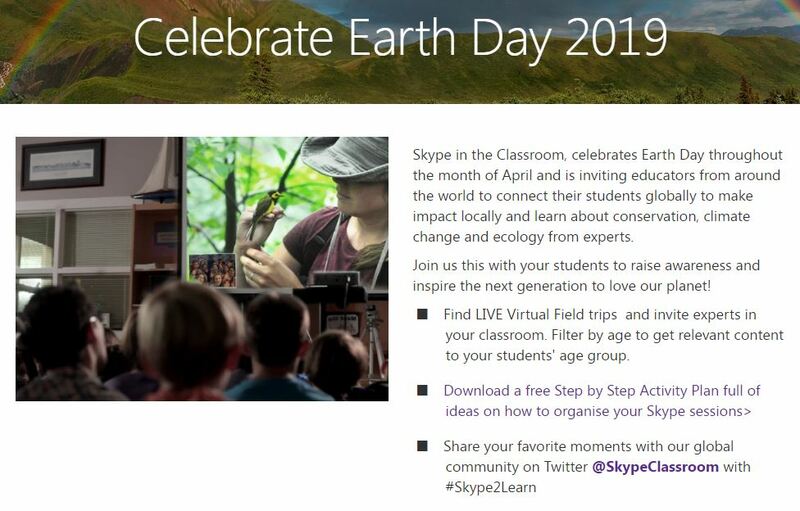 In this post, I will show you how you can use Skype in the classroom to connect your students with rich learning experiences around the world. Skype is an application that has been around for more than a decade now and allows its users to make video or just voice calls via the Internet. Skype also has a chat function or instant messaging with multimedia elements such as images, videos and emoticons. There is a Skype for business where you can even share your monitor so the user in the other end of the connection can see what you see on the screen. It seems like a normal tool similar to other applications that allow video chat and instant messaging, but let’s see the potential uses of Skype in education. How can we use Skype in the classroom? Skype is a Web 2.0 technology that can be used for learning in and out the classroom. One of the activities instructors can do with Skype in the classroom is to invite a guest speaker from around the world to share through video conference knowledge in a particular area. 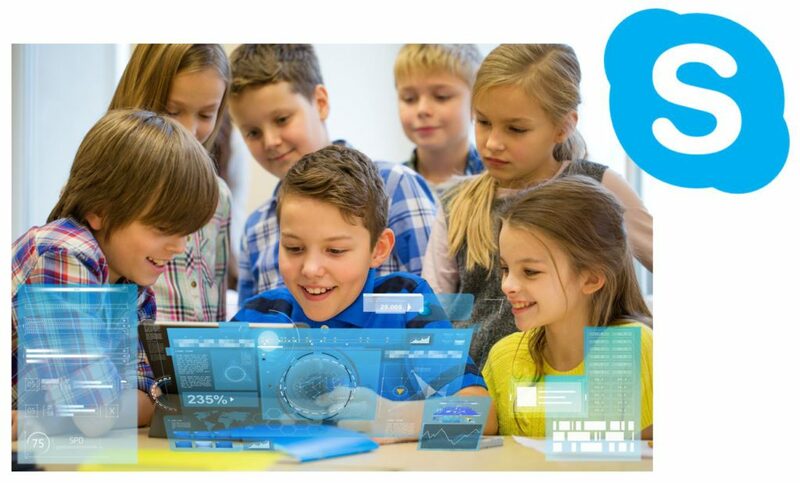 Skype in educational settings is offering virtual field trips to allow students see on video places from around the world while having the possibility to interact with the people in the field to ask questions or raise any inquiries about the place of the field trip. One example of an educational activity with Skype was a beautiful experience that took place this week. The experience consisted in having a live Skype with the guest speaker Dr. Jane Goodall, a world-renowned scientist and environmentalist. 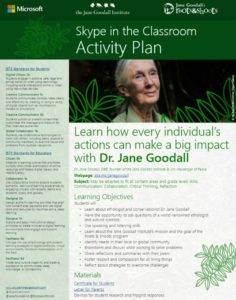 In the live chat, Dr. Goodall and her team answered questions from students, educators and parents about how to care our planet, animals and the environment. Before starting the live chat, Microsoft Education offered a variety of resources to help educators plan different activities in the classroom. Some of the materials provided guidance about what to do in the classroom to start a discussion with the students, the learning objectives, brainstorming questions, reflection activities, taking a selfie with Dr. Goodall, use of hashtags # and social media tags to share the experience with other students around the world and a certificate of participation for the students. Virtual field trips: connect your students with zoos around the world, a park in India to learn about dinosaurs, aquariums in different countries, conservation parks, museums, and many other places! The different themes and virtual tours available come with lesson plans, learning objectives, target audience and many other educational resources. You just need to keep an eye on their calendar of events to plan and book with time the activity or live chat you would like to attend with your students. 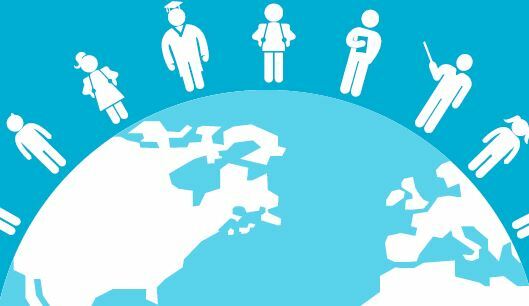 Skype collaborations: collaborate with other classrooms around the world to learn a language for example. It would be great to put your students to have conversations with other students who speak another language to really immerse them and make them communicate as if they were actually in that other country. Mystery Skype: Skype helps teachers organize a Mystery Skype game where the classroom is going to connect with another classroom in another part of the world and with the students making questions and interacting they have to guess the location of the other school. With this game, students can learn as well about other cultures, languages, and places around the world that would be hard and expensive to access without the use of a tool such as Skype. How can you use Skype for eLearning? The live sessions can be recorded and embedded as a video into an eLearning module that can be shared with the audience that couldn’t attend the live event. eLearning could be formed with webinars, live chats and other synchronous events that allow students and educators to connect at the same time but from different locations. There are many lessons and classroom activities already planned and just ready to use. Promotes connectivism and social learning. You need to register to an activity that will be appropriate for your time zone. You need to make sure that the technology will work before doing a classroom activity with Skype. Make sure your internet connection is good enough for a good quality audio and video. Poor quality in the connection will be detrimental to the learning experience. Parents, educators, students, businesses and everyone who wants to connect with someone else located in a different location. There are lessons to guide educators on the use of Skype for the classroom. The lessons come with webinars and introductory short courses to help you get started. When you complete a course, you gain points to achieve a Microsoft Digital Certification. 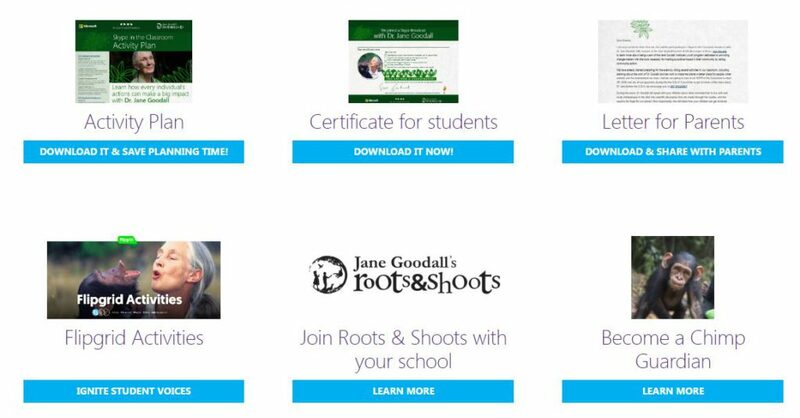 There are also lots of resources, webinars and specific courses to implement Skype in the classroom. There are lots of support and resources available. You could also use Microsoft help desk in case you don’t find a solution, but generally the application is really easy to use. Skype for education is free 😀 for business purposes it has a cost and it comes as part of the Office 365 package. The cost structure starts from USD12$ per month. Using Skype in learning promotes communication, collaboration, listening and speaking skills, geography skills, creates a global community of learners and allows teachers to collaborate globally (What’s going on in Mr. Solarz’ Class?, n.d.). According to Chou (2003), “successful interaction is highly dependent upon how comfortable a learner feels working with the delivery medium”(p. 268). Skype is an easy to use technology that has commonly being in used for many people at home to connect with friends and family located on different areas, which makes this technology a comfortable tool that can be easy incorporated in the classroom. A wide variety of content can be delivered using Skype such as geography by connecting with explorers or people in different parts of the world, history with live virtual visits to museums, biology, and technology among others. The possibilities are limitless as long as teachers have an internet connection and organize collaborations with institutions, other teachers, or people on the other side of the screen to present the content in a real setting. All these possibilities offered by Web 2.0 technologies open a wide variety of options to deliver education around the world, connecting people in remote areas and making quality education available to a bigger community of learners. As an instructional designer I envision the use of multimedia in education to facilitate the delivery of relevant and engaging content where teachers and instructors collaborate globally to create a big virtual classroom with students from around the world and specially to reach those who cannot access traditional education. Your students will love the experience! Chou, C. (2003). Interactivity and interactive functions in web-based learning systems: a technical framework for designers. British Journal of Educational Technology, 34(3), 265–279. Skype in the classroom. https://education.microsoft.com/skypeintheclassroom?